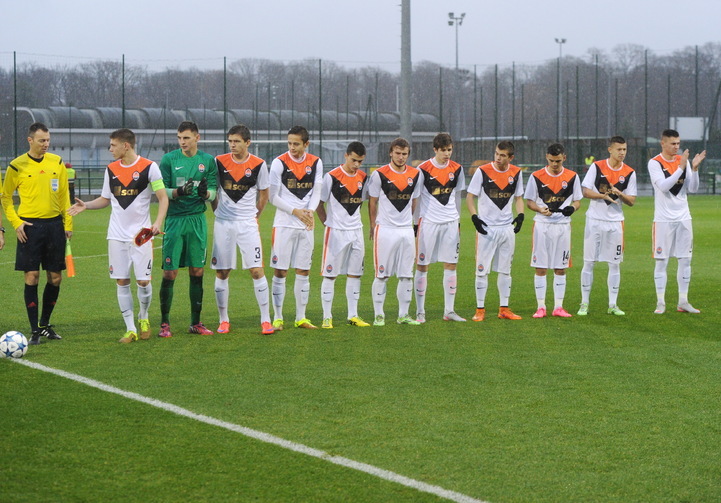 In a match of the UEFA Youth League, Shakhtar U19 faced their peers from PSG. December 8th, 2015. Saint-Germain-en-Laye. Georges Lefebvre stadium. 9C. The final game in the UEFA Youth League did not have a tournament importance for the Pitmen, who had no chances to climb above third place in the group. The group leaders, PSG, needed a win in this match to remain in first place. The starting line-up saw the competition debutant Maksym Chekh. Giorgi Arabidze missed the game due to injury. The Pitmen started the game confidently, but as early as on 7 minutes, the Paris team could have scored, but the forward’s close range shot flew over the crossbar. Soon, the scoring was opened: the hosts hit the Pitmen on the break, Augustin made a run down the left flank, drifted inside before firing a powerful shot into the far corner of the net to make it 1-0. PSG enjoyed great dominance, they easily penetrated Shakhtar’s penalty area, but there were not many shots. After thirty minutes of the game, the hosts slowed down, which allowed the Pitmen to take the initiative. Oleksandr Pikhalyonok fired a dangerous shot – the ball took a deflection and came close to crossing the goal line, and the second corner kick in a row brought the Pitmen success. Oleksandr Zubkov flicked the ball at the near post for Pykhalyonok to make it 1-1. After that, the Paris team stepped up the tempo, and Augustin hit the goal post with a free kick. The Pitmen kept fighting under heavy pressure and could have scored before the half time break as Pykhalyonok fed Andriy Boryachuk, whose shot was parried away by the goalkeeper. After the half time break, the match saw an end-to-end game. The Paris team operated quicker on wet pitch because of rain and created scoring chances. On 58 minutes, the corner kick led to a goal, when Ikone headed the ball goalwards. After six minutes, the error by the Pitmen’s defence allowed Meite to bear down on goal to send the ball straight into the corner to make it 3-1. The Pitmen managed to bring intrigue back to the game, but Dmytro Topalov failed to slot in a cross from the left by Volodymyr Grachyov. On 76 minutes, the Paris team scored again. After the ball bounced off the defender’s foot, none managed to prevent Eduar to fire from close in. The Pitmen responded soon: there was again an attacking move down the left flank, and after an Oleksandr Glagola pass, Topalov sent the ball into the net in a similar situation. That scoreline did not remain for the long time. The hosts easily penetrated the Pitmen’s penalty area, and Eduar volleyed the ball into the corner of the net to make it 5-2. So, Serhiy Kovalyov’s team suffered their fourth win in the group stage of the competition to finish fourth to complete their campaign in the current edition of the UEFA Youth League. PSG and Real Madrid are through to the next stage.